2015 wasn't the greatest year for typography books. Seems there's so much training and inspiration on the web, the book biz has slacked off a bit. There are a lot of new books springing up focusing on the art of hand lettering and illuminating type! Here are just a few that we can highly recommend. Add these to my "essential" list of typography books! Typography 33 from the Type Directors Club is the only annual devoted exclusively to typography, showcasing the year's best typographic work in books, magazines, stationery, web graphics, and more. This year's winning designs were selected by American graphic designer and artist Paula Scher. A principle at New York's Pentagram, a design consultancy firm, Scher has received numerous industry awards for her work developing graphic identities and branding systems for such clients as Tiffany & Co, Coca-Cola, Bausch & Lomb, Citibank, the Museum of Modern Art, the Metropolitan Opera, New York Times Magazine and many others. NOTE: the 34th edition of this book has sold out, and only the Kindle edition is available. From the basic shape and form of letters, to cursive script, spacing, and alignment, artists will discover how to transform simple words, phrases, and quotes into beautiful works of hand-lettered art. 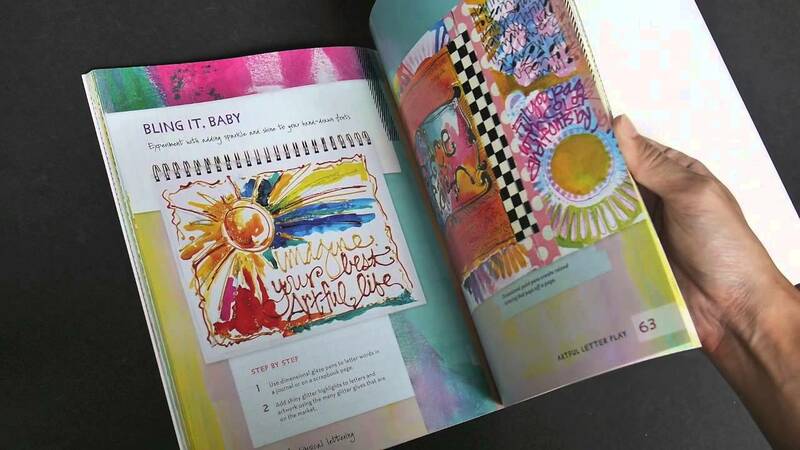 The interactive format and step-by-step process offers inspirational instruction for a wide variety of fun projects and gift ideas, including hand-rendered phrases on paper and digitally enhanced notecards. 80% of the comments give this book FIVE STARS... one reader writes : If you are looking for a beautifully illustrated, marvelously written book on the art of lettering this is the one! I cannot begin to tell you how excited I am to complete each and every challenge. Joanne Sharpe has written a book that will help be become a better artist but also has me asking myself the hard questions. The Art of Whimsical Lettering is an artful instruction book on creating stylized fonts and expressive artwork with personal handwriting skills. Author Joanne Sharpe shows you how to create exuberant and personalized writing styles for your artwork–whether it be a journal, canvas art, or other projects that use text. Here is a practical book that not only teaches a full course in professional lettering but also contains dozens of hand-lettered alphabets that may be reproduced without cost or permission. How good does it get ? There's a ton of good fonts stuff we haven't even touched yet, so we'll be back with a lot more this month and next! Remember, if you have favorites, we'd love to hear about them, just give us a shout! And, ... The Fonts Fest Continues!